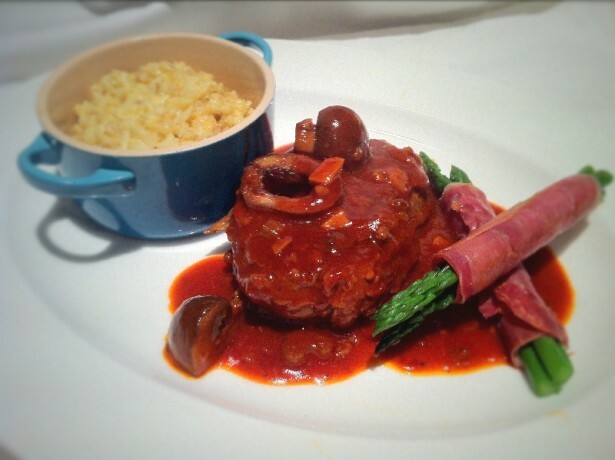 Osso Bucco with a Pearl Barley Risotto. Osso Bucco literally translates as “Bone with Hole”, this is quite obvious from the photo. The bone is filled with marrow and over slow cooking the marrow melts into the sauce. This cut is traditionally done with veal shank. It can be used with other cuts, but if you can get a hold of it use it. As it’s not full on red meat the dish also lends itself to a white wine and tomato based sauce, rather then a standard red wine/ beef stock stewing liquor that is used for beef. Two traditional accompaniments marry this dish together. The main being polenta or a Milanese risotto. My wife doesn’t particularly like either. Therefore, as is fashion at the moment, I decided to try a risotto with an alternative grain. This being the pearl barley. I love its texture in broth and thought it would be ideal in a risotto as it doesn’t turn into a mush. The key to it though, is overnight soaking. Begin the Osso Bucco. Dust the shanks with flour and brown on both sides in a pan. Remove. Add the vegetables and cook until they begin to caramelise. Add the shanks back, with the wine and reduce it over a high heat. Now add all the remaining ingredients. Cook in a low oven 150°c for two hours. For the risotto, cook as you would any risotto. Sweat the shallot, add grains and wine. Boil until evaporated and then slowly add the stock, 200ml at a time and cook for 18-20mins until the grains are tender. At the end, season add the mascarpone and parmesan. Blanch the asparagus for 3mins and refresh in cold water. Wrap three spears at a time together with the parma ham. Place in a hot pan just before serving to crisp the meat. Either serve as shown, or as I did with the other dish. Place risotto in the middle of a plate with the Osso Bucco on top. Drizzle the sauce over them both. Happy New year to you … !!!! Thanks Viveka, hope you had a great time over the festive period. One if my husband’s favourite dishes and your rendition is quite lovely David. I usually don’t soak my barley, but rather toast it gently in the pan before adding the stock or water to it. Toasting makes it taste lightly nutty. I like the toasting tip Eva. I do this with normal risotto rice but was worried about how long the barley would take to cook. Do you have a rough guide? I assume about 40mins? I like a slightly andante barley with some bite to it, but 40 minutes does sound logical. I’ll time it next time I make it. This looks absolutely delicious! Happy New Year to you and your loved ones!! Looks delicious gourmet meal You are right, we can have good dinner in home. I’ve been wanting to make a barley risotto…thanks for the inspiration. All the best in the coming year. Looks great and always, wonderful presentation! Have a great New Year! Ossobuco: one of my favourite Italian recipes..My Mum used to prepare this dish very often when I was young: she added borlotti beans. I think that mushrooms combine pretty well with the rich meaty sauce too!!! Yummy. I’m liking the bean idea Rita. I don’t know why I don’t use them more often!